As transit systems have searched for new revenue streams to offset lower sales tax revenue and state funds, they have turned to unconventional methods to bring in extra money. New green and online technologies are opening up avenues for cash flow. The atypical methods have also added convenience to the customers’ riding experience. Virtual grocery stores allow customers to shop while commuting. Regenerative braking on some of those commuter trains makes the ride greener, and offering passes through deal-of-the-day websites makes it easier for out-of-town customers visiting for the weekend to purchase their passes. Some transit agencies have been able to maximize ad space in their rail stations, which has upped revenue and allowed riders to be more productive during their commute. Transportation media sales company Titan, online grocery store company Peapod.com, and transit agencies — including Southeastern Pennsylvania Transportation Authority (SEPTA), Chicago Transit Authority (CTA) and Massachusetts Bay Transportation Authority (MBTA) — have partnered to use ad space to more closely engage riders and their ever-present smartphones during their commute as well as help increase ad revenue. Peapod launched more than 100 sites at commuter rail stations in Boston, Connecticut, New York, New Jersey, Philadelphia, Washington, D.C., and Chicago. The virtual store technology features billboards with grocery “aisles” on the train platforms. Commuters with iPhones, iPads, or Android phones scan a QR code on the billboards to download a free PeapodMobile app and shop by scanning bar codes of the products displayed in the aisles. Commuters can make selections from Peapod’s online store after registering on its website and schedule home deliveries for next day, or days or weeks in advance, during their train rides. Once on the PeapodMobile app, customers have access to more than 11,000 popular and store-brand products. Peapod partnered with national consumer products brands, including Barilla, Coca-Cola, Kimberly Clark and Proctor & Gamble for the project. In particular, SEPTA was able to bring in more advertising revenue this way through its relationship with Titan, which created the ads and the app for the Peapod campaign. Early last year, Titan was approached by Crain Communications, the local ad agency for Peapod and Giant supermarket, looking to create an interactive idea to reach SEPTA riders and promote Peapod service for on-the-go supermarket shopping, Jon Roche, VP/GM, Titan, explains. Titan shared a concept that started in South Korea with British supermarket Tesco. Tesco tested the use of QR codes as a way for people to buy groceries as they waited for trains to arrive, Dave Etherington, Titan’s senior VP, marketing, says. The campaign uses space that normally holds ads for branding and creating virtual shopping shelves, where riders can purchase items from them directly using QR codes. DART asked Titan what it could create on a similar scope using its media assets. Titan suggested a train station platform ad, known as a two-sheet poster with side-by-side placements; one of the posters looks like a supermarket shelf holding products that include QR codes riders can scan to buy products with their smartphones, and the other ad has a description of Peapod and how to use the service. “It’s a new way to make the advertising more exciting to the consumer and the companies that advertise in the market,” Roche says. 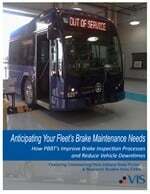 The initial campaign with SEPTA started in early 2012. 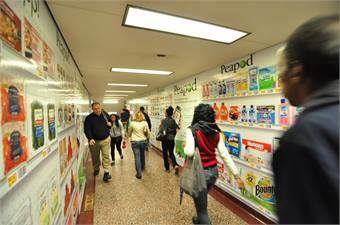 Peapod bought ad placements at approximately 20 stations and ran multiple campaigns of 12 weeks each. The campaigns generate advertising revenue on a monthly basis. SEPTA was the first market that Titan tested, Etherington says. Since that first campaign was so successful, Peapod asked Titan about other markets where similar campaigns could be conducted. The ad agency soon struck similar agreements with NJ Transit, MBTA and CTA. CTA’s most recent campaign, for two sheets at several stations, ran at the end of last year. The agency also added a tunnel wrap, covering the entire tunnel walkway, creating a visually arresting and interactive experience, like walking through a supermarket, at one of its main hub stations.